Of the four Dartmouth grads who earned valedictorian honors during this June’s commencement, would it surprise you to learn that all four will be pursuing careers in the financial sector? While many Dartmouth graduates end up working in finance, private equity, consulting, etc., there are also many Dartmouth grads who pursue careers in other industries like education, government, entertainment, and engineering. Secretary of the Treasury Timothy Geithner and his predecessor, Hank Paulson, may both be graduates of the College on the Hill, but that doesn’t mean every Dartmouth student is following in their footsteps. 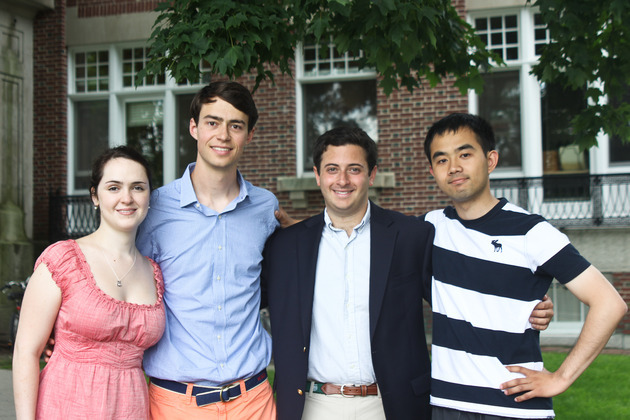 So why are all four valedictorians at Dartmouth this year starting careers in the financial sector, you ask? All four valedictorians in Dartmouth’s Class of 2012 are pursuing careers in the financial sector (photo credit: Jenny Che, “The Dartmouth”). So of the valedictorians, two will be working for Goldman Sachs, one for Morgan Stanley, and one for McKinsey. It shouldn’t be surprising that all four ended up in finance if only because so many Dartmouth alumni have also gone into finance…and we all know that Dartmouth alumni love to give back to their alma mater. What better way to give back to your alma mater than in giving its graduates coveted jobs? And don’t forget that firms like McKinsey tend to hire almost exclusively from the Ivy League (or equivalent institutions like Stanford, Duke, MIT, etc.). But maybe it is indeed just coincidence that all four valedictorians happened to go into finance. It certainly isn’t a reflection of the entire graduating class. Not all Dartmouth alumni go into finance. Just this year’s Dartmouth grads with the top GPA’s in the class.